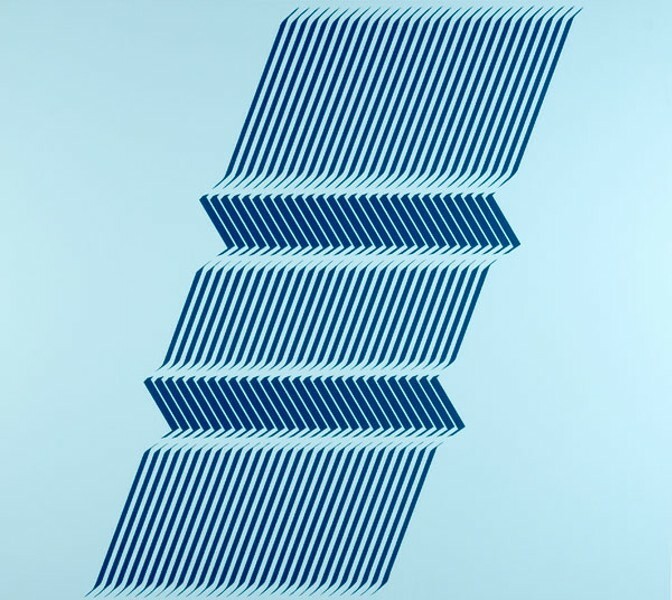 The printmaker, painter, photographer, and animator shows us that op art is still fun. Few art movements in the modern age are as primarily identified with a single decade as op art is with the 1960s. More than abstract expressionism before it, op art was easily digested by an increasingly consumerist society, and buoyed by countercultural currents ranging from public political protest to personal mind-altering experimentation. Although it didn't preclude images of people or things—as a slew of psychedelic LP jackets attests—op art was notable for taking abstraction to a new plateau, merging color theory and the science of optics with the heightened precision that emerging technologies afforded. A big part of its appeal was that it was fun. But the movement peaked by 1965, and by the mid-1970s was passe, as the world lumbered toward postmodernist reassessment. In recent years, however, when we're temperamentally poles apart from the go-go 60s, optical art is making a comeback—not as retro, but as a lively extension of past traditions. And in Mark Pease's new show, op is still fun. A painter, printmaker, photographer, and animator who teaches at the University of Southern Illinois, Pease cites among his influences op art pioneer Bridget Riley, James Turrell and Robert Irwin of the Light and Space movement, and sculptor Olafur Eliasson, whose monumental 2003 installation The Weather Project at London's Tate Modern Pease recalls as "a great environmental op art piece." In his new work Pease eschews the retinal vibration effects associated with early op art's hothouse colors and undulations in favor of a cool, creamy palette, and lines and forms meticulously generated through computer stencils of his hand-sketched patterns. The circular shapes of his silk-screen-on-paper print series Disk Variations II echo early op art's recurring motif of the eye as the door to perception. But rather than disorient the viewer by throwing into question what one beholds, these prints—with their concentric circles and pie-wedge shapes, evoking early TV test signals—are, if not soothing, pleasing in their symmetry and harmony. They work because they operate on a visceral level, resisting narrative interpretation. The same can be said of Pease's series of paintings Climb Into Space, where he addresses his preoccupations on a larger scale. These works, spray-painted acrylic on nylon, employ rectilinear shapes of banded lines that here and there taper off into slight folds. The results are like watching ribbons unfurling, or waterfalls. Grouped snugly along the wood-paneled walls of Las Manos's latest home, a smaller but better space than its old Clark Street location, the paintings provide an immersive experience that rewards repeat viewing. Rounding out the show is one representational work, Galleria, a 25-minute CGI animation from 2012. A single-take bird's-eye view of a shopping mall, devoid of people but dotted with recognizable retailer names, it fits with the other works only as regards Pease's fascination with color gradations.